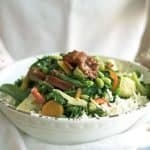 Super Food Stir Fry Vegetables is a versicle healthy dinner recipe. This is a vegan recipe but you could add tofu, shrimp, or chicken to add some protein. Serve them over brown rice or quinoa for a complete meal. In a large skillet heat up 1 Tablespoon of olive oil. Toss in the frozen vegetables, edamame, and kale. Cook until the vegetables are thawed and the kale has wilted (about 10 minutes). Pour in the Stir Fry sauce, and cook for another 2-3 minutes. Serve over rice.